By Susan Montoya Bryan "The Associated Press"
ALBUQUERQUE, N.M. — Federal officials said Friday there are more Mexican gray wolves in the wild in the Southwest than there have been in each of the past five years, giving a glimmer of hope to a program that has been struggling to return the endangered animals to their historic range. The annual survey results were released by the U.S. Fish and Wildlife Service after months of tracking the animals on the ground and from the air during helicopter and plane surveys done last month. Note: The situation with wolves in the United States changes rapidly. This article, first published on the Hancock Wildlife Foundation's website in June, 2010, is being republished to bring it up to date with recent developments. 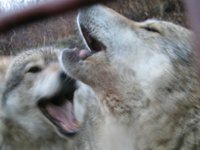 The recent history of the legal and population status of wolves in the northwestern and western-central United States is a complex story - those wishing to read only a brief summary of the most recent status (as of December 2011) may want to skip ahead to the Current Status section. - AES. The war against the wolf in the Western US during the late 1800s and early 1900s was especially virulent. As more of the landscape was allotted to livestock and more of the wolf’s natural prey was eliminated (especially buffalo), wolves preyed more on the ungulates most available to them – domestic livestock like sheep and cows – and the campaign against the predator escalated . While the war was fueled by economic interests (not only to protect livestock and reap bounties, but also for pelts), unreasonable fear and hatred motivated some wolfers (people who killed wolves) to not only kill but also torture their targets. Wolves were burned alive, clubbed, hung, or left to starve with their lower jaws cut out or their Achilles tendons severed. Yet, in spite of the veracity and persistence of their pursuers, wolves proved to be resilient, and some individual wolves even became legendary for their ability to elude hunters and trappers. 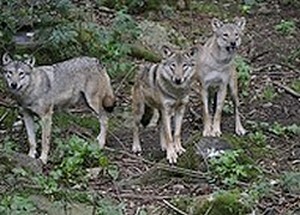 It is possible to strengthen the Swedish wolf population by importing wolves from other countries according to a new report by the Environmental Protection Agency and two other agencies. The plan is to import at least 20 wolves by 2014 to prevent inbreeding and ten county administration boards have been asked to find places where the new wolves could be moved. “We have reached the conclusion that it is possible to strengthen the wolf population by importing wolves to Sweden,” Maria Ågren, director general of the agency told Swedish Radio News. At the same time the much criticised license hunt for wolves will continue but according to Ågren this doesn’t necessarily hurt the wolf population.